Welcome to My Christmas Home Tour! 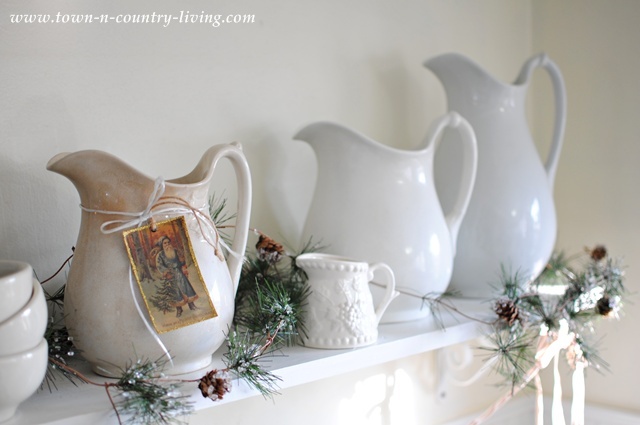 Welcome to my Christmas Home Tour … coordinated by the “All Things Home” group! I’m so excited and honored to have you visiting my humble abode during the holiday season. This past week I’ve felt like one of Santa’s Elves scurrying about in a flurry preparing for Christmas! I hope you’ll take time this week to visit all the houses on this week’s virtual Christmas Home Tour … there are 30 in all, filled with Christmas eye candy galore just for you! And at the end of this post is a chance to win a $200 gift card from One King’s Lane. Also … I’m participating in Jennifer Rizzo’s Deck the Halls Party! 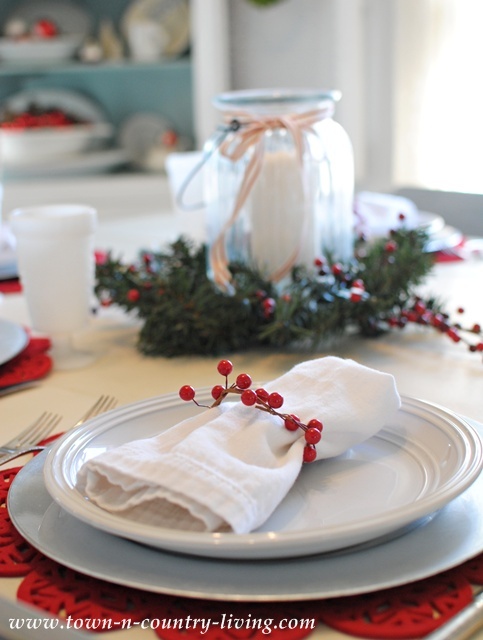 … but something got into me and I chose this festive color for my 2013 Christmas tablescape. 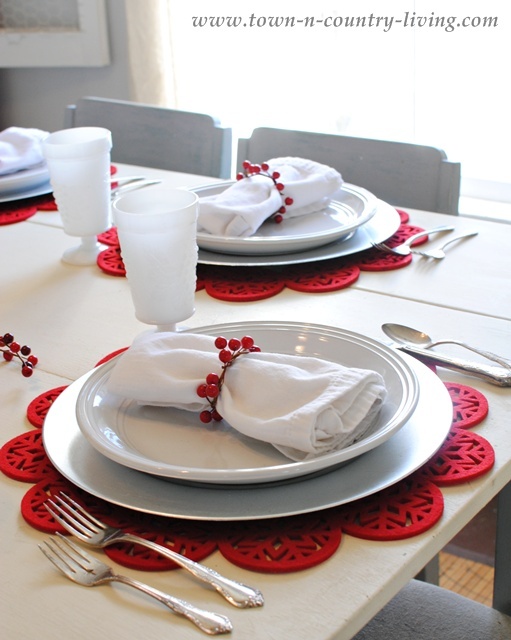 It all started with the red snowflake place mats I found at Home Goods. Silver chargers add a bit of glitter to the table. I couldn’t find the napkin rings I wanted, so I made some by snipping strands of berries from floral sprays. Bend them into a circle and twist the ends together to form your napkin ring. Vintage silver plate and milk glasses complete the red and white Christmas table setting. 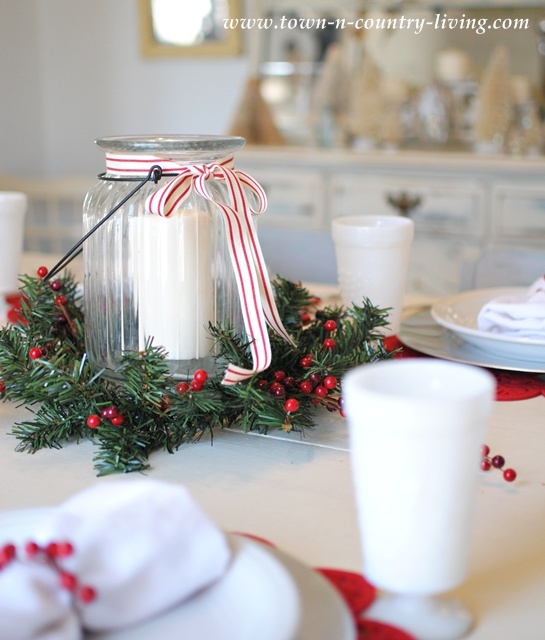 My Christmas centerpiece is simply a big glass jar with a white pillar candle tucked inside. Greens and berries add color and texture while a red and white ribbon adds a bit of whimsy. I’m really lovin’ the red and white theme in my Christmas dining room. 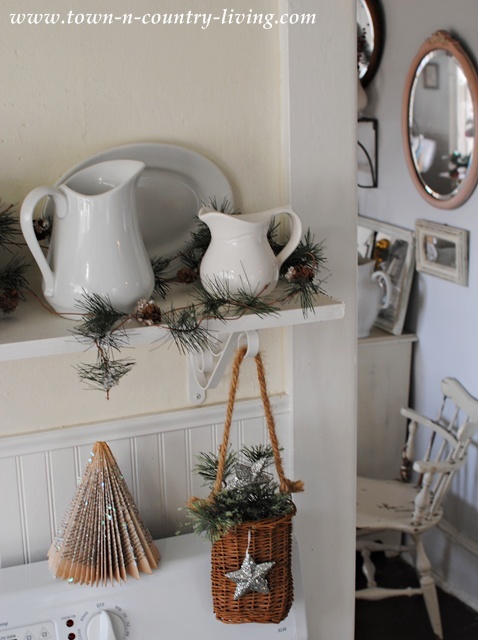 My corner hutch is always fun to decorate throughout the seasons. 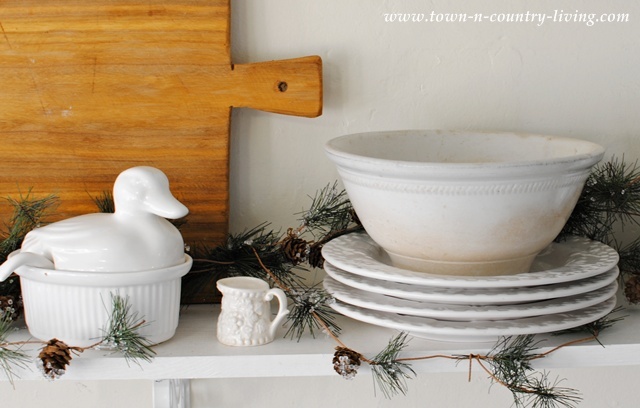 Touches of red join my white ironstone collection. Shall we move on into the kitchen? Our farmhouse kitchen is located on the north side of the house, so I’ve kept the colors light and neutral. We installed the open shelving earlier this year and I quickly loaded it with white ironstone. The kitchen has this fabulous trio of windows over the sink. 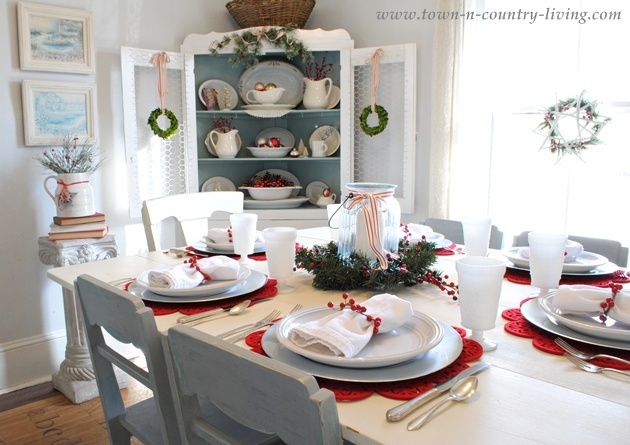 Each one is adorned with a white ironstone dish and a blue mason jar stuffed with tulle and red berries. More open shelving and an old bead board cabinet flank the opposite wall. 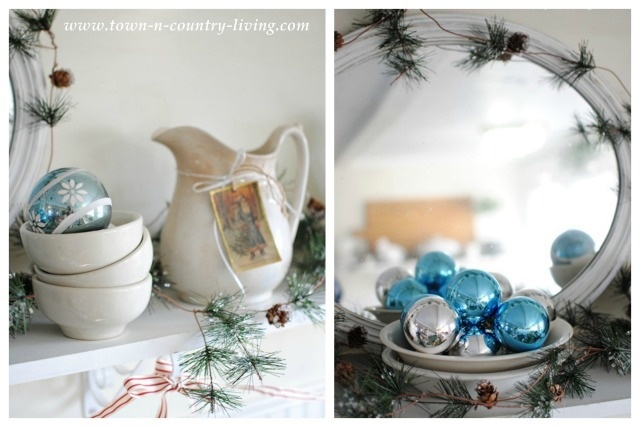 Simple greens and blue and silver baubles add Christmas cheer. 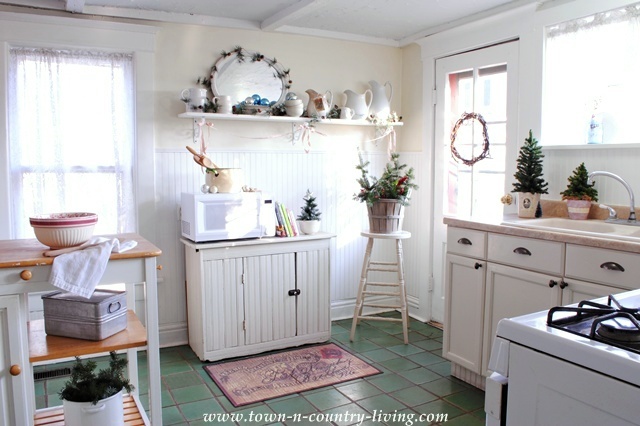 Christmas greenery adds farmhouse freshness to my humble white kitchen. I made the bottle brush trees and will soon share how to make them. 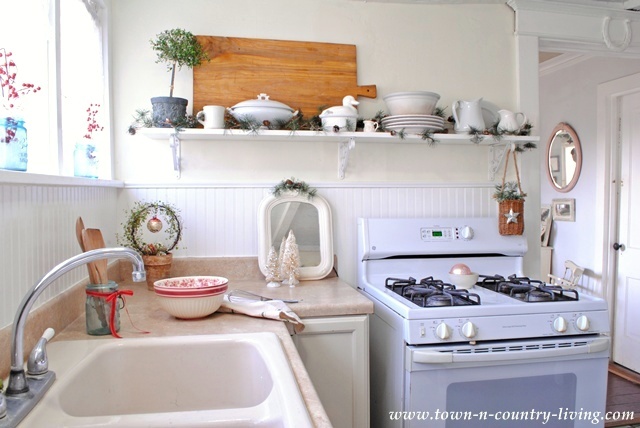 On December 12th I’ll share the other half of my kitchen during the Farmhouse Christmas Tour with 8 other bloggers. Yes, that’s right … even more Christmas inspiration for you, but this time with a farmhouse theme! 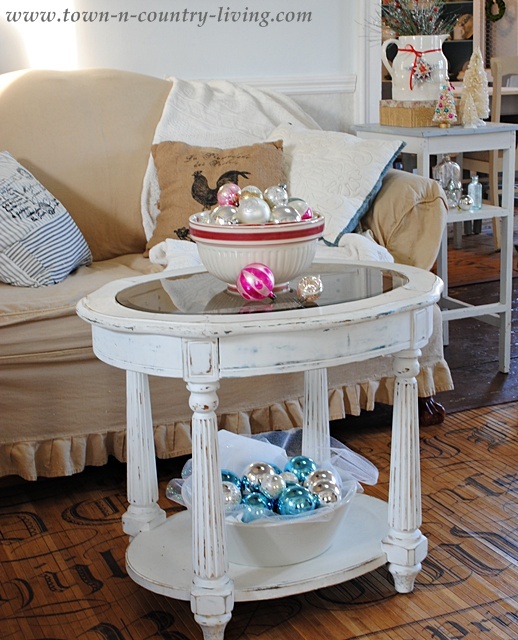 Let’s head on into the living room for more of my Christmas Home Tour. 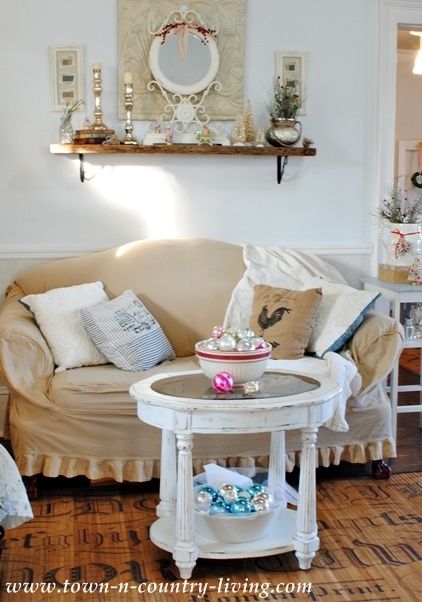 I must confess, I still want to add more Christmas inspiration in this room. Don’t ask me what, though. I haven’t decided yet … it just feels like it needs something more! 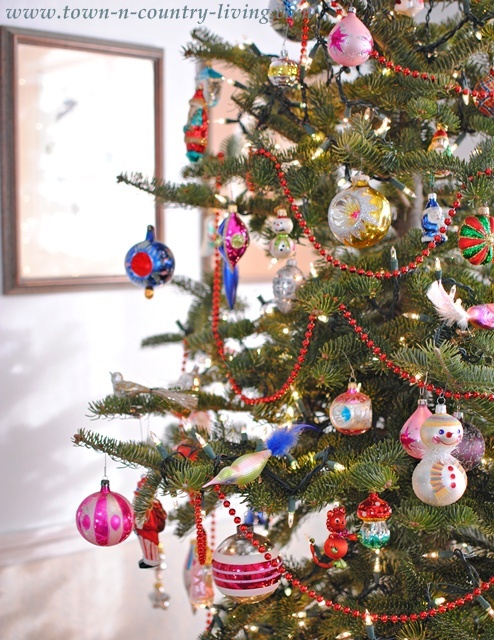 My Christmas motto is … you can never have too many vintage ornaments! My favorite part of decorating the tree is hanging the ornaments. I do not like stringing the lights, however! We cut down our tree at Lee’s Trees. I was looking for the perfectly imperfect tree. When I spied this tree sprouting from a ditch, I knew I found the one! Crooked trunk and imperfect branches. Even the tag said “Charlie Brown Tree” on it. The price was a mere $25! Perfect! Last year I trimmed lots of branches off our tree … I didn’t want to have to do that again to fit the ornaments. 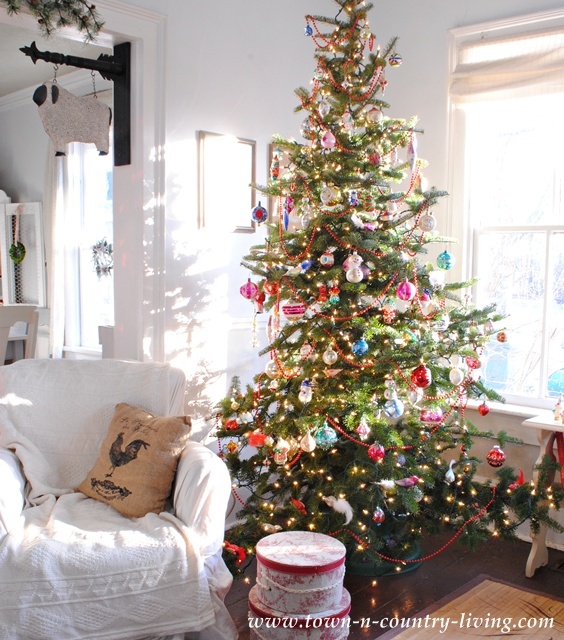 Now that today’s Christmas Home Tour is over, I can sit down and relax by the tree! 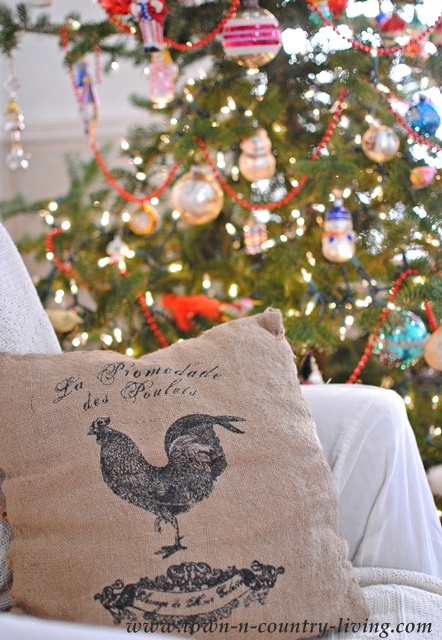 This beautiful rooster pillow is from The Everyday Home’s Shops. 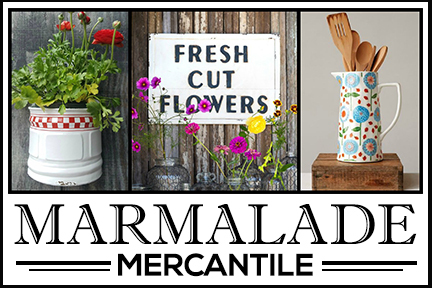 I want to give Barb’s online shop a shout-out as a way to thank her for organizing this tour! 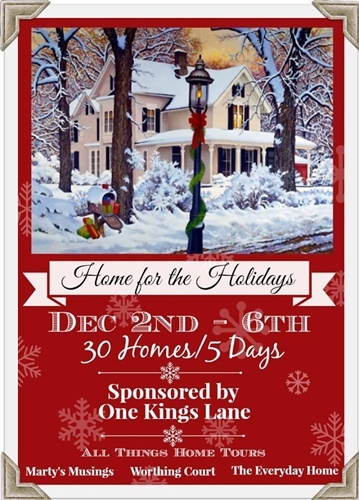 Here’s this week’s Christmas Home Tour schedule. Enjoy!! Very pretty, Jennifer! Love the touches of red. 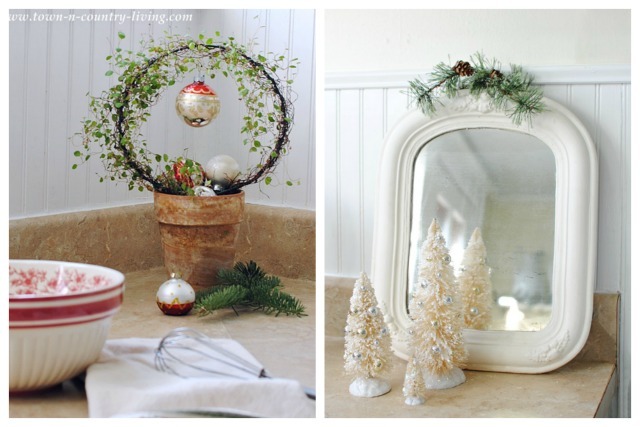 Your home is always a visual treat Jennifer and I truly love your Christmas decorating. It looks so welcoming and I’d love to sit at the dining table with you. Congratulations on a beautiful holiday home. Love your house all decorated up! Especially the 3 window display! Your photography showcasing your beautiful Christmas home is incredible, Jennifer! I love the vintage feel … the crisp red and white in your dining room and your “perfectly imperfect” Charlie Brown tree is beautiful! Merry Christmas! It is all so beautiful! I absolutely adore your style drink in each room over and over. Thank you for making to time to share your gift with all of us! Simply beautiful! I adore everything about your home and your decor. Gorgeous!!! Jennifer, I thoroughly enjoyed touring your beautiful home. You have outdone yourself. You have the best shaped tree. Sooo pretty~ and I just adore that tree- how charming!! Your home is lovely decorated for Christmas!! Pinning away!! I’ve so enjoyed the tour of your beautiful Christmas home! Your photography is stunning too. That dining room will haunt my dreams. The white with red and blue is just a perfect holiday combination. You nailed it all out of the park and I’m truly feeling inspired. My pinning fingers are going ot be hurting. I absolutely love it all ~ great job decorating and photographing it too! Jennifer, I love the mix of red, white and blue in your kitchen and dining area. Such an unexpected combo for the holidays, but it works so well. Those blue mason jars look amazing with that simple touch of red on them. 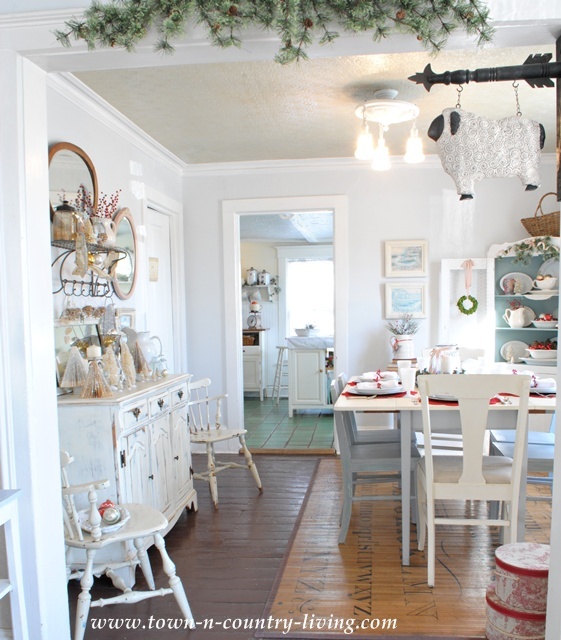 I’m excited to see the rest of your farmhouse kitchen decorated for Christmas. 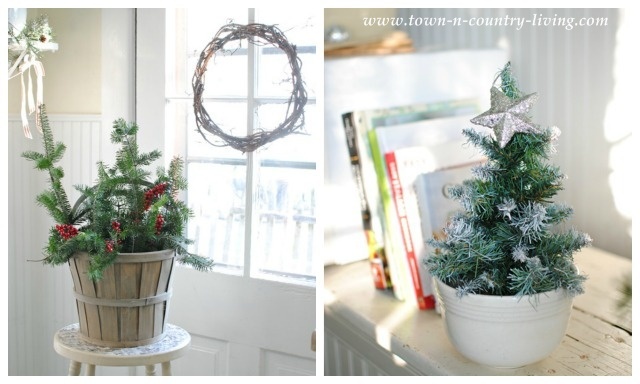 Your home is the perfect setting for holiday decorating, you are a tough act to follow! BEAUTIFUL Jennifer…I LOVE all the pops of red!! Could you share the paint color for the back of your hutch? Emily, the paint color is Duck Egg Blue by Annie Sloan Chalk Paint. Lovely tour! Your tree is beautiful! I love that your tree is imperfect in shape but perfectly decorated. I also have a natural tree each year, so I won’t put it up before a few weeks. And mine is always crooked also, part of its charm! Jennifer, your home is always amazing. I hope I win!!! Everything is just so festive! I love all the pops of green and red with your country whites. Beautiful! Your home looks so beautiful for Christmas. I love all your wonderful decor. Your tree makes me smile. Beautiful decorations mostly White like your entire home, but the splashes of red really does it! Very warm, pretty and inviting. Beautiful!! You did a beautiful job on your decorating. I love your tree it has such character and charm, the bowls of ornaments are precious and I love how your have your table set, red and white are my favorite for Christmas decor!! You did a wonderful job. The whites and reds together are stunning. I am so envious of your ironstone. The pieces are gorgeous!! 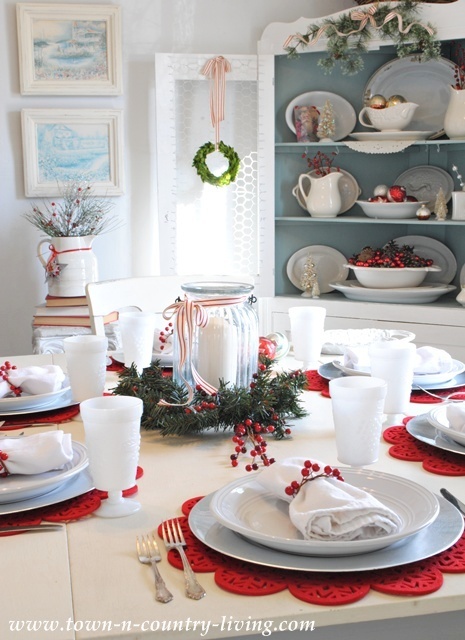 Red is my favorite color at Christmas and your dining room is so beautifully done. Love, love your Christmas tree! p.s. real trees really are best!!! I adore the simplicity of your holiday decorations. Just the right amount of red. It is absolutely lovely. Jennifer you home looks stunning as always! 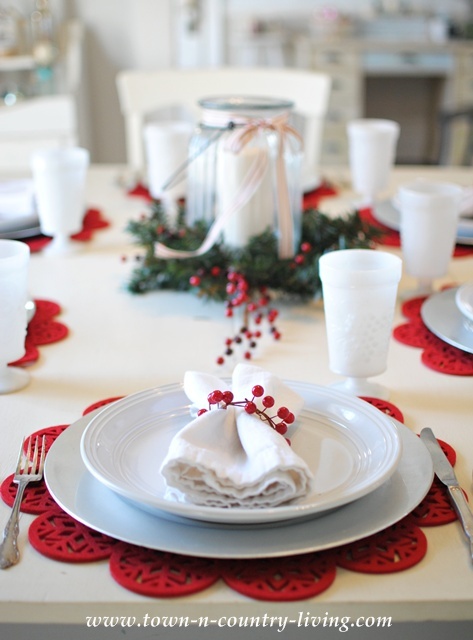 Love your tablescape and the vintage Christmas touches… just lovely! Everything looks just beautiful! LOVE your kitchen and your sweet tree. I would love for you to come on over and see my Santas!!! 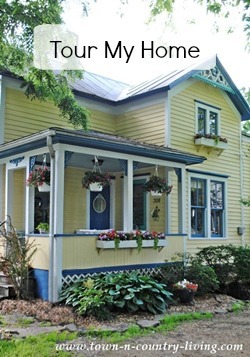 Your home looks so cheery!!! I love the red and white theme you chose. Happy Holidays!!! beautiful- love all the touches of red on your soft palette and the natural touches are perfect! I could look at your photos all day…love the pops of red, my favorite color! So, so beautiful. Love it all! Jennifer, I love your touches of red in your home! 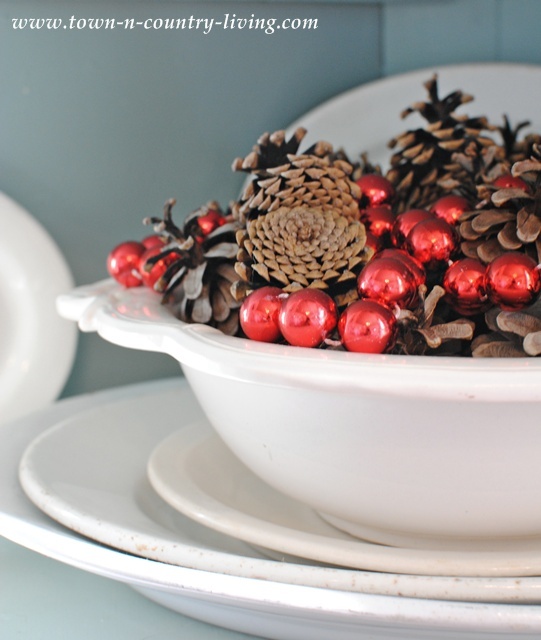 I especially love that photo of the bowl with the vintage bulbs with the bokeh! I have never decorated with so much red as I have this year, but I am loving it! I never thought I liked white-until I saw your house! I love the crisp clean look-it is great with the greenery and touches of red! I love red and white together, especially at Christmas. Your decorations are so pretty with the red berries and greenery all around. 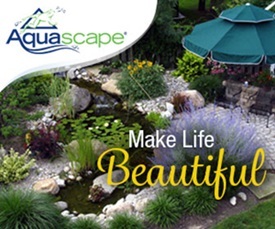 Your home and decor is so beautiful. Thanks for the tour. Just magazine worthy my beautiful friend. Gorgeous Jennifer! I am in love with that white and red tablescape-perfection! Beautiful! I love the pops of red with the abundance of white and neutrals, and lots of greenery. I plan to do something similar…so thanks for your inspiring photos. You have such a beautiful home and such a knack of decorating. Of course you know I love red and white! A refreshing holiday scene at your place. Jennifer your décor is amazing as usual. Your PHOTOGRAPHY is spectacular. 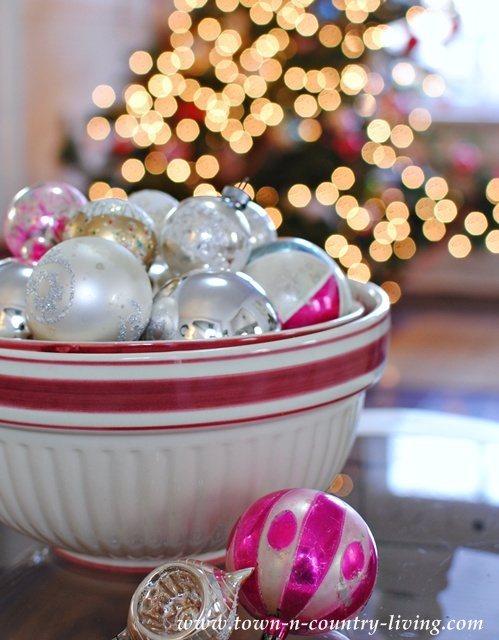 I LOVE the pic with the bowl of vintage ornaments and the bokeh of tree lights behind. The vintage blue jars with red berries are divine. Endlessly inspiring! You know I’m a great fan of your home’s decor – LOVE the touches of red in your Christmas decorating! It goes beautifully with your white dishes and blue accents! Beautifully done! So so so lovely Jennifer! Your perfectly imperfect tree is truly perfect! You outdid yourself Jennifer – it’s stunning! Your home looks absolutely gorgeous Jennifer! So pretty, Jennifer! 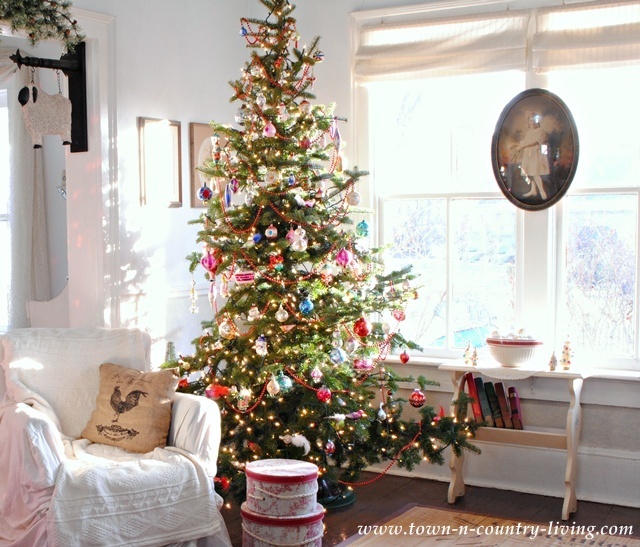 I love all the simple touches, pretty vignettes and yes, one can never have too many vintage ornaments. I’m back to see it again! I’m especially admiring all the pretty dishes and pitchers today. Gorgeous Jennifer, truly gorgeous! I adore the book page trees….I need to make some. Hope you had a wonderful Thanksgiving! Your reds this year looks spectacular with all of your whites!! It’s always fun to be invited into your home, Jennifer. Love the red, the great light flooding your home, and the photography. Well done and inspirational! Love your house!!! Especially the kitchen……in the process of using the same colors…..the yellow, turquoise and white! Jennifer, LOVE your chrismas decor! very inspirational with wonderful touches! Okay, I admit it – I’m having a little house envy right now! 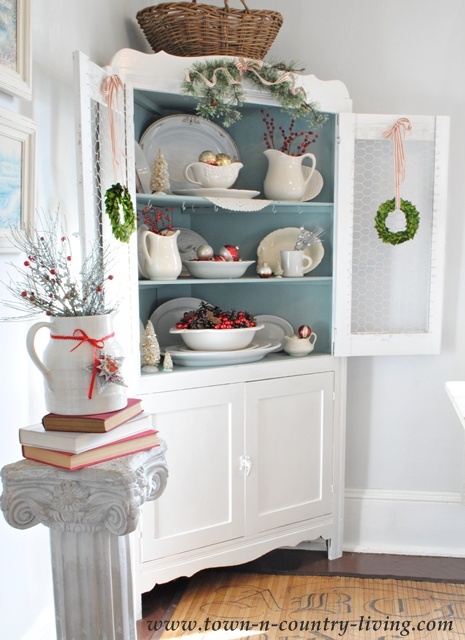 Your holiday home is just charming – every single detail! Your home looks just lovely decorated for the holidays, Jennifer! I love the red accents you’ve added to your dining room this year! I love the simplicity of your home, just beautiful! So lovely! I’m not usually a “shabby white house” person but when you add all that red, it’s perfect! Thanks so much for sharing! Jennifer – everything looks so lovely! I love the pops of red that you added for Christmas. And your Charlie Brown tree is adorable! 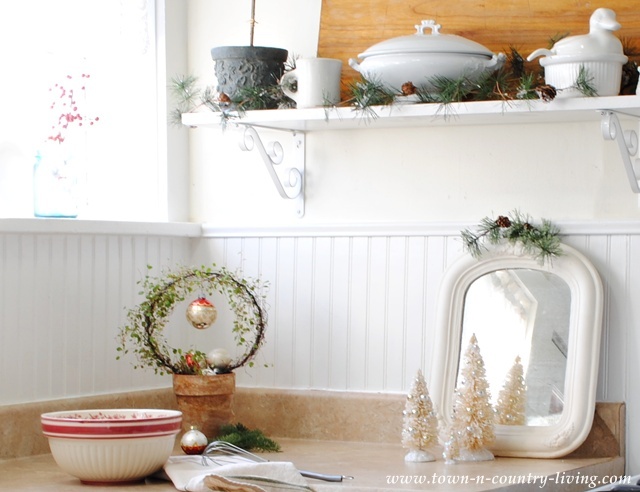 Your home dressed up for the holidays is magical. It all looks so cozy and festive. Love your home!!! and your Christmas tree is gorgeous!!! I would love to have a tree like that but I have a cat that loves to hide out in our tree. I love how all the whites help make the colors pop. Beautiful! It’s all so beautiful, Jennifer. I love the red and also your perfectly imperfect tree. You just have a certain touch that gives your decorations a soft and feminine feel that I really love! Jennifer, your home looks amazing, as always — and I am LOVING all the red in the dining room! FABULOUS and FESTIVE! Your farmhouse is so lovely! I love all the white. The red was a perfect choice for your dining room. Jennifer, your home is so very charming! 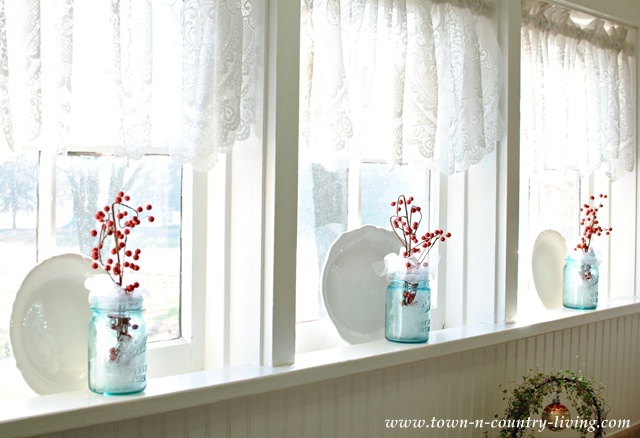 I love the red and white in the dining room and the red berries in the blue mason jars. I feel right at home, you’ve made me feel so welcome!! The pops of red are just wonderful! so so pretty, all light and bright! 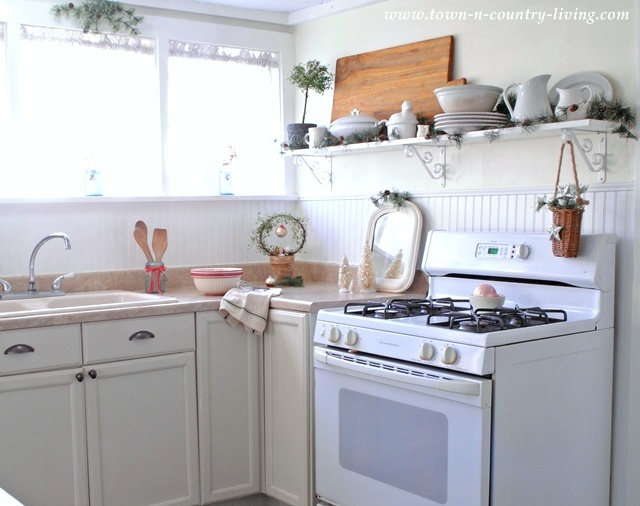 Love it all and that amazing corner cabinet decorated in white! I just love your home, it is so well done. I enjoyed seeing it in Simply Shabbilicious magazine. 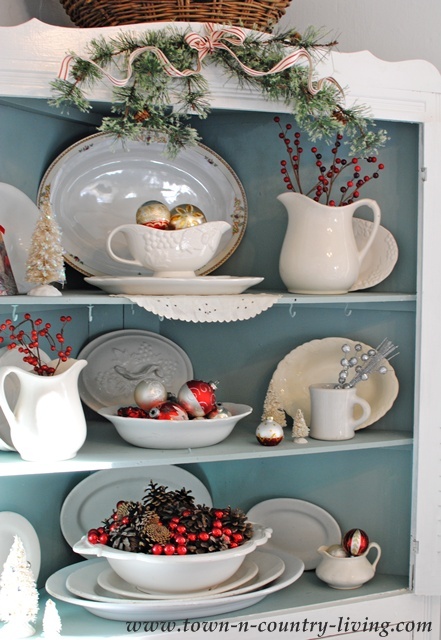 I love all your festive touches, and oh my goodness, I would love to have all that ironstone. One of my favorites! Hope you have a Merry Christmas! its all so pretty , but i am especially smitten with your tree!!! 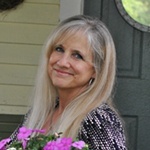 Happy to be visiting again from the Christmas in July link party. Your home is lovely and you have added some lovely Christmas cheer. Your tree is very pretty. What type of tree is that? Thank you! Hi Andrea! I don’t know what type of tree it is, unfortunately. It wasn’t located on the tree farm where most of the trees were. It was actually growing out of a ditch and because it was so quirky-looking, we wanted it and we cut it down. They only charged us $25 for it since it looked like a Charlie Brown tree. The trunk was crooked and branches were sparse, but that’s what we loved about it.